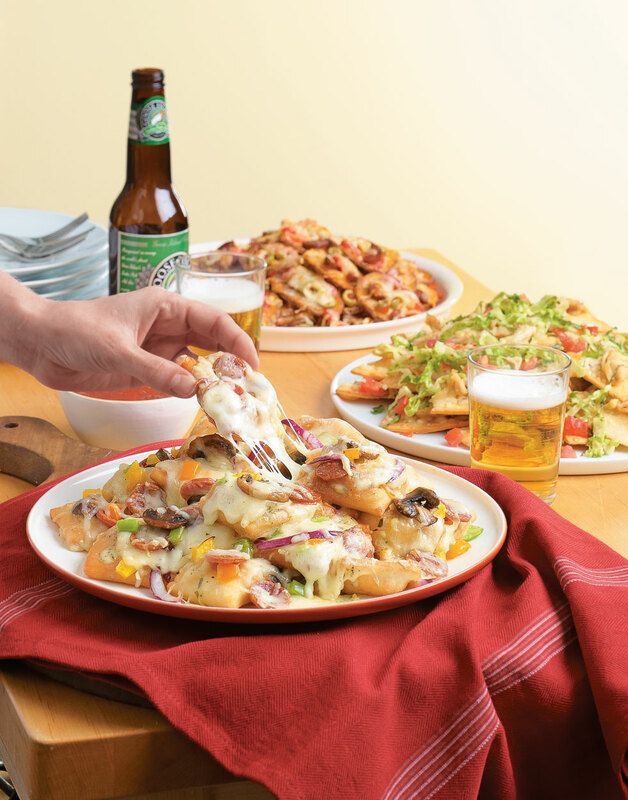 Pizza, meet nachos. Combine two of your favorite guilty pleasures for a "macho" nacho experience that kids and adults will love. If using frozen pizza dough, quickly thaw it by coating the dough with olive oil and placing it in a resealable plastic bag. Submerge the bag in a bowl of hot water until the dough is pliable. Heat peanut oil in a 7- to 8-qt. pot over high until it registers 375° on a candy/deep-fry thermometer. Heat olive oil and butter in a saucepan over medium for the creamy pesto. Add garlic and cook 1–2 minutes. Stir in flour and cook 1 minute more. Whisk in milk and simmer until sauce thickens, 3 minutes. Whisk in pesto; season with salt and black pepper. Cook pepperoni in a skillet over medium-high heat until crisp, 5–7 minutes. Transfer pepperoni to a paper-towel-lined plate to drain. Cook mushrooms in drippings until they release their moisture and brown, 8–10 minutes. Roll pizza dough on a lightly floured surface to 1⁄8-inch thick. Cut dough into 2-inch squares. Fry dough squares in six batches until golden brown, about 1½ minutes per batch. Transfer chips to a bowl using a slotted spoon, season with salt, then transfer to a baking sheet while frying remaining dough. Preheat broiler with rack 6–8 inches from element. Top chips with creamy pesto, pepperoni, mushrooms, bell pepper, onion, and cheeses. Broil nachos until cheese melts and is bubbly, about 2 minutes; serve immediately with pizza sauce. Cutting the dough into similar-sized pieces ensures they'll cook evenly and in the same amount of time. Because mushrooms absorb the flavors you add to them, cook them in the pepperoni drippings.